Experienced artist, Marcula Stauffer, shares four tips for increasing your project’s worth. HOUSTON, TEXAS, UNITED STATES, March 8, 2019 /EINPresswire.com/ -- Pursuing a career as an artist can be both fulfilling and challenging. Slaving over a canvas for days, weeks, or even months requires vulnerability and determination. So what can an artist do to get the most profit out of their projects? Marcula Stauffer1 shares four techniques for increasing the worth of your art. First things first, people need to know that you are an artist. Marcula Stauffer recommends creating an online presence using social media and an online art gallery. A free platform like Instagram allows you to share your work while showcasing your personality. The audience will start to feel like they know you, and will be more open to purchasing. Creating a website is also necessity for listing available items with prices. Online shopping is very popular, so why make buying art more difficult than it needs to be? Marcula Stauffer notes that despite online tools, it is still very important for new artists to network, be social, and share their talents with others. Invest in quality photographs of your finished artwork. This will enhance your chances of selling pieces and also help you develop a catalog. Marcula Stauffer believes that it’s important for artists to look back at what they have done in the past, and reflect on how they have grown over the years. Clients may also be inspired by a previous work of art and pay extra for a commissioned piece that is similar. Plus, if there is ever any question of who created the artwork, having a photograph of it in your studio can really save the day. 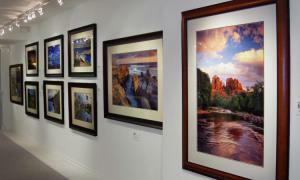 One of the most challenging components of selling art is the ability to be flexible with pricing. When choosing an initial price, Marcula Stauffer considers3 the cost of materials first, the number of hours of work, and the size. Although you know your time is extremely valuable, customers who purchase multiple items will expect a deal. While knowing your worth is important, it may not be the best idea to shy away from offering flexible pricing packages. As a new artist, this will help you move more pieces and get your name out there. Help potential customers connect with you and your artwork by including detailed descriptions with each item. Marcula Stauffer explains2 that when a customer understands the context, emotion, or story behind the creation of your artwork, they will be more likely to resonate with it in their home. Always explain from your perspective, letting others decide what it means to them. A piece of art with text will always be worth more than one without. Don’t forget to title, sign, and date your creations.